Blacktop Precision Bass, 4-string bass guitar from Fender in the Precision Bass series. Fender introduces the new Blacktop series basses —the Blacktop Precision Bass and Blacktop Jazz Bass guitars. 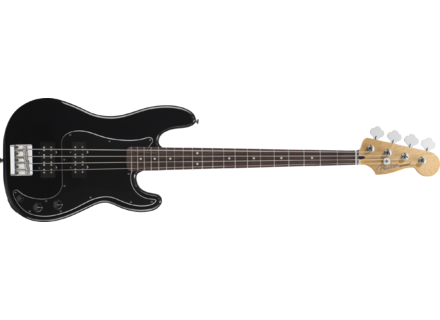 The Blacktop Precision Bass guitar features two pummeling Blacktop Bass humbucking pickups. Other distinctive touches are three Jazz Bass control knobs (volume for each pickup and master tone) and a HiMass bridge. Features include an alder body, maple neck with C shape and gloss urethane finish, rosewood fretboard with 9.5” radius and 20 medium jumbo frets, three-ply black-white-black pickguard, open-gear tuners and chrome hardware. The growling Blacktop Jazz Bass features dual Blacktop split-coil Precision Bass pickups. Like its sibling, it too has an alder body, maple neck with C shape and gloss urethane finish, rosewood fretboard with 9.5” radius and 20 medium jumbo frets, three-ply black-white-black pickguard, three Jazz Bass control knobs, HiMass bridge, open-gear tuners and chrome hardware. New DNA Line of Bass Speaker Cabinets David Nordschow Amplification (DNA) announced the launch of its speakers designed for bass guitars and double bass instruments.